25/6- Good news for farmers in Lower Crowndon: Meteorologists in the area are saying that the quadrennial influx of locusts may be smaller than predicted after a meager first hatching. Bretodeau warns against being too relieved, however. Still, the news comes as a bit of relief to Crowndon, which has experienced an economic downturn in recent weeks. 18/6- Dark news today, as reports from air ships returning from the colonies report that Waystation Bravo, one of four airborne outposts that provide shelter and supply to ships making the journey across the Barrier Ocean, has gone missing. The first indication that something was wrong came at the beginning of last week, when the merchant ship Hewlett’s Pride arrive at the northwest corner of the Waystation system’s circuit. After Hewlett made a report to Waystation Charlie’s port-master, frigates were sent to investigate. As part of search protocol, several of these frigates traveled to the center of the circuit. What they found horrified them. The mysterious storm has put scientists across the Triumvirate on edge. Neither the Triumvirate Sky Authority or Bredoteau are willing to comment that the storm has anything to do with Waystation Bravo’s disappearance. 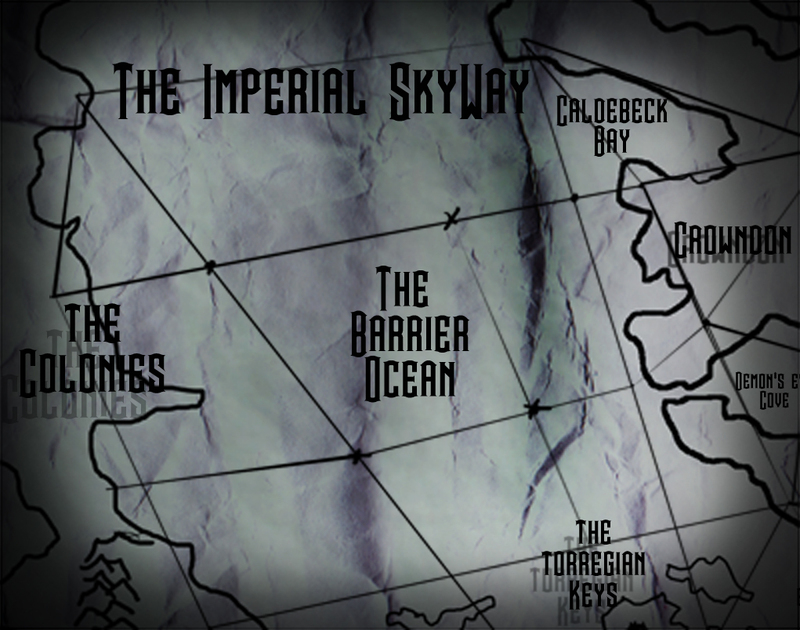 The large criminal presence aboard the Waystations certainly calls into question the safety and long term viability of the entire affair, but they remain a prime economic link between the Triumvirate and the Colonies, and the Crowndon Air Corps claims that rousting the criminals would likely lead to the complete loss of the stations. The Blackwood Gazette will continue to report on this situation as it develops. Adella Chatelaine is the editor and chief of the Gazette’s NorEastern branch and lead investigative reporter. She built her career as a freelancer and is notorious for her hard hitting interview style. When not traveling the Triumvirate looking for a story, she is a fixture in a wide spectrum of NorEastern social circles. 8/5-The southern provinces of the Crowndonian Empire, including the major trading centers of Walsh and Toring, are preparing for an invasion. Not from any human army, but from the hordes of Albino Locusts that descend upon the area every four years. Not to mention millions of lives. Southern Crowndon has a problem with poverty, and they rely on the surplus grain from farms like Gracia’s to survive. Crowndon scientists are unsure what causes the quadrennial influx of the insects, but entomologists and climatologists in the Nor Eastern Empire share a theory. This year marks the end of the four year cycle. So when can Crowndon expect to be covered in locusts? “Within the next couple of months,” said Dullane. *Editor’s note: Quotes are printed as spoken…any scientific inaccuracies are the fault of interviewee, not the Blackwood Gazette. 1/5-The Imperial Blackwood Authority is up in arms today over reports that the Sarnwainian Empire has plans to pursue oil based combustion engines. Blackwood magnate Marco de Santana isn’t worried. The opinions of the citizenry seem to indicate otherwise, however. Scientists from around the Triumvirate are the most concerned with this development overall.